VersiJack® is a heavy duty screwjack pedestal designed for floor, deck, paver, beam and bearer support. 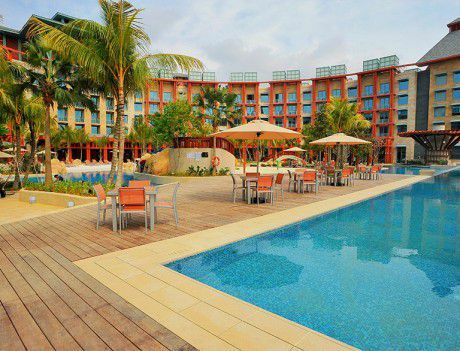 VersiJack is used in the construction of roof terraces, pedestrian walkways, roof gardens, plaza decks, sun decks, balconies, pool surrounds, podium landscapes and verandas. VersiJack® screwjack pedestal is adjustable in height from 37 mm to 1030 mm, with the use of proprietary “extenders”. An integrated slope corrector adjusts for slopes up to 5%. VersiJack® reduces sound transmission, increases heat insulation and allows unsightly services to be concealed within the cavity under the elevated platform allowing easy access, when required. 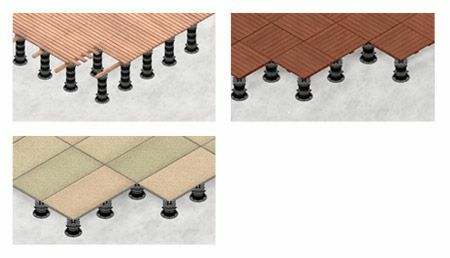 VersiJack® can be used to create raised floors with most pavers including granite, marble, porcelain and precast concrete. 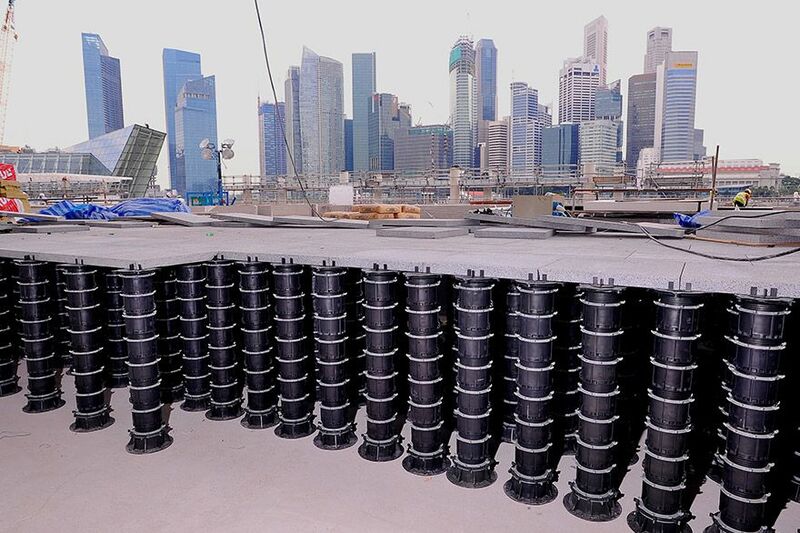 They are also widely used to support timber and composite bearers under decking. VersiJack® is excellent for creating reusable or temporary exhibition flooring. 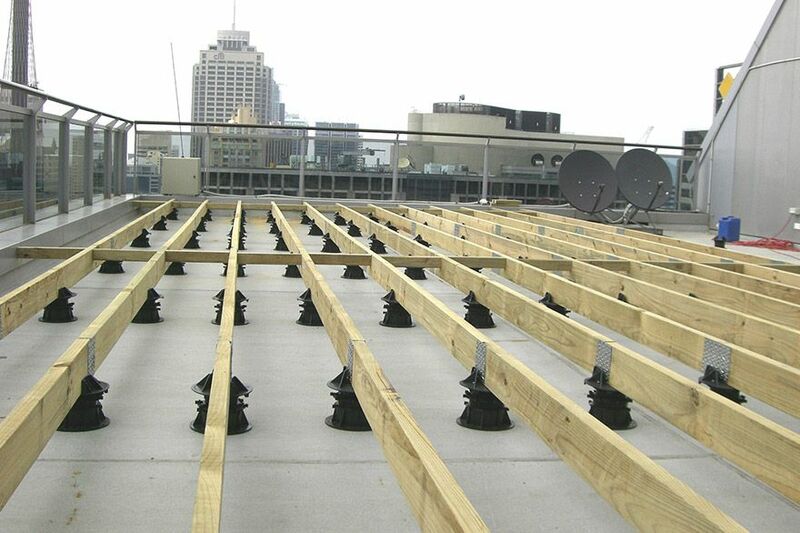 VersiJack® is a raised decking product. Measure the total area to be paved to determine the number of pavers or beams required. One VersiJack® screwjack pedestal is required for every paver or for approximately each linear metre of beam to be supported. Use sight or laser lines to mark the intersections of the corners of each paver to be laid. Adjust the 0-5% inclinator to compensate for any fall in the slab. 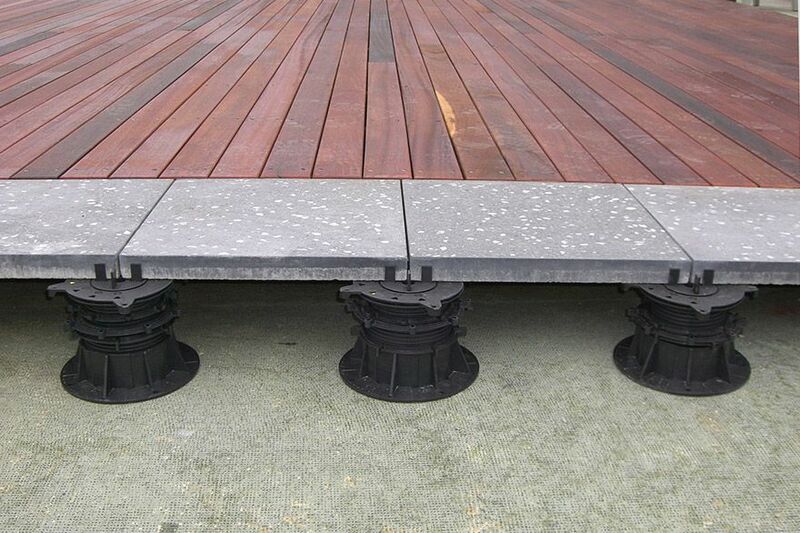 Use 1-2 mm VersiJack® rubber shims if required to ensure each paver is level. Position VersiJack® screwjack pedestals without tabs where edges and corners are to be supported. If necessary, saw along marked score lines on the bottom of the units so that units may be positioned along wall edges or in corners. Commence paving by positioning the first paver in a corner and subsequent pavers along a wall edge. Place the pavers into place on each VersiJack® screwjack pedestal and simply adjust either up or down to ensure each paver is level. Position VersiJack® screwjack pedestals under beams and adjust units either up or down. Screw the beam into the eyelet in the top of the VersiJack® or tie the beam to the screwjack unit to ensure stable floor support.